It’s almost that time… Feasts with family and friends, sharing a glass of wine and lots of hugs (we hope)! We finally have an excuse to bust out the “good stuff” in preparation for the holidays – elegant table linens, fancy guest towels and special occasion outfits! But even the most refined gatherings are chock full of opportunities for spills. And if your family and friends are like mine, forget about it! Spills are inevitable – and holiday stains are the worst! Never fear, Moxie Girl is here with some great solutions for these common but tough-to-remove stains. The “greatest hits” of holiday stains are usually due to one or more of these activities. Eating and drinking, of course, are the mainstays of any holiday get-together. It’s also “splurge season” so we’re likely to be diving into a lot of rich foods, full of greasy, saucy or buttery goodness. Then there’s the wine… Mmmmmmm….holidays and red wine – they just seem to go together. I always hope there will be at least ONE person I want to hug anywhere I go. I also hope they’re wearing stay-put lip color. Unfortunately, we’ve all had the experience of a hug leaving a mark on our clothing. 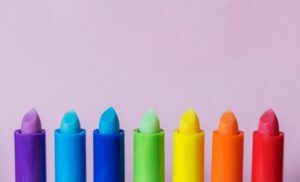 Heck, I’ve even dropped my own lipstick during application and had it skip down my entire outfit before it landed on a new turquoise blue bathroom rug. And it wasn’t even a holiday! Read on to get the heads up on how to save your good stuff from stains! Whether a holiday stain occurs on a garment, linens or even upholstery, keep this blog handy and you’ll know just what to do. First, is it Dry Clean Only? Because if it is, you should probably let a professional dry cleaner handle this problem. This goes for any item, garment or table/decorative linen. 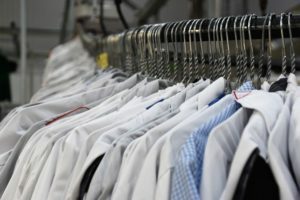 Now, since it’s a holiday, it may be a minute before you’re able to get to a drycleaner – so to keep the stain from getting any worse, scrape off any solids. No rubbing! Take the item to your dry cleaner as soon as you’re able, point out, and let the dry cleaner know what caused the stain. If you use a home dry cleaning kit, apply the pre-treatment provided (according to product directions) before putting the item in the dryer bag. I’m so-so on the home kits, myself. In addition to a residual odd smell, I haven’t had a ton of success using them to try to remove stains. For oily stains such as from meat, gravy or butter, scrape any solid bits from the fabric. Do not rub during this step – rubbing will only push the stain further into the fibers of the fabric. Pre-treat the stain with your favorite laundry product, if you have one – or try a little Dawn dishwashing liquid. Gently scrub your choice of pre-treatment into the stain – an old toothbrush is great for this task! Let the pre-treatment sit for 15 minutes then wash in the hottest temperature safe for the item. Check the stain before drying to make sure it’s gone. If necessary repeat the pre-treatment and wash again, BEFORE drying. Drying the stain will only “set” it, making it permanent! Take care of the oil/wax component of the lipstick stain by pre-treating the same way you would for the oily-type stains mentioned above. After pre-treatment, it’s time to tackle what’s left of the pigment portion of the stain. Use an oxygen-based bleach, safe for most colors and fabrics, mixed with a gallon of cold water. Check directions on your bleach bottle, but usually, 1/4 cup of bleach to one gallon of water is about right. Submerge the stained item and soak. You can check the stain periodically, and keep soaking until the stain is gone and then wash as normal. Again, check that the stains are gone before drying. Repeat the pre-treatment and washing, if necessary. You’re singing that song now, I’ll bet – at least the chorus. 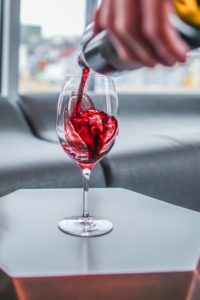 For FRESH red wine stains, removal is easy as long as the item is able to withstand boiling water. Do not use this method of wine stain removal on a ‘dry clean only’ item unless you are truly making a last ditch effort to save it. Locate the wine stain on the item and pull the stained area tautly over an appropriately-sized mixing bowl, or other fairly deep but also large-mouthed vessel. (I’ve done this for tiny stains using a large, plastic drinking tumbler.) The bowl should be big enough so that you have a few inches of unstained fabric around the edge of the stain but inside the diameter of the bowl. Use a large rubber band to secure the fabric over the bowl. Pour boiling water through the stained fabric into the bowl, taking care not to splash. Once you’ve flushed out the stain entirely, launder the item as you normally would. Now, if you’ve got a wine stain that is not so fresh, it’s far tougher to remove but I’ve had luck with this technique. Mix small but equal amounts of hydrogen peroxide and Dawn dishwashing liquid – start with a half teaspoon of each. If you think your stain is going to be particularly tough to remove, mix two parts hydrogen peroxide to one part Dawn dishwashing liquid. Lay the item on a flat surface and put an old towel under the area of the stain so as not to transfer it to another part of the garment or item. Rub the hydrogen peroxide and Dawn mixture into the fabric, gently, with your fingers. Start in the middle of the stained area to keep from making the stain bigger. Thoroughly saturate the stain with the solution and let the item sit for 30 minutes. Rinse with the hottest temperature water safe for the item. Hopefully, your old wine stain is gone, but if not repeat the process before drying! If you have a stain on vintage or silk upholstery, stop right there and call a pro if you care about the piece! For other carpet and upholstery, as with garments and linens, scrape or lift solids from the stained area. Do not rub! 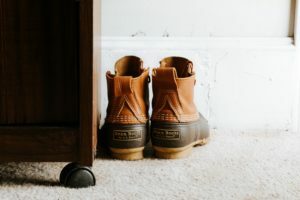 For these next steps, be careful to not over-wet your carpet or upholstery. Always do a “test” spot treatment in an inconspicuous area of the furniture or carpeting for color-fastness before treating the actual stain. If anything weird goes on in the test spot, stop and call a pro! If your test spot looks normal, proceed. If you have a carpet cleaning product on hand, use a clean white cloth or a paper towel and treat the stain according to directions on the product packaging. No carpet cleaning product on hand – or just hate chemicals? Try a tablespoon of Moxie Girl favorite, Dawn dishwashing liquid mixed with 2 cups of hot water. Add a tablespoon of ammonia and mix. Blot solution on carpet or upholstery with a clean sponge and then a dry towel. Repeat until the stain is gone. Using a fresh clean towel dampened with warm water, “rinse” the stained area to remove soapy residue which could attract more dirt later. Avoid the area and let it air dry completely. 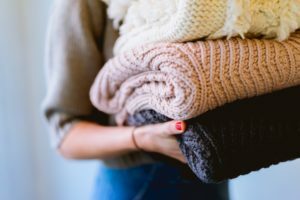 Moxie Girl hopes these tips help you stay stain-free through the holiday season and all year long. Check our blog frequently for more helpful tips and fun features on all sorts of Moxie topics!